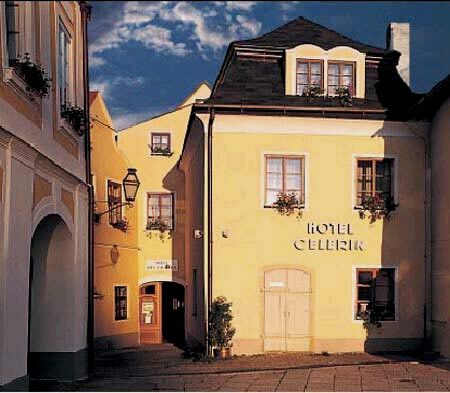 Hotel Celerin is situated directly in the main square of Telc only a few steps from the chateau. Rooms are equipped with private bathroom, TV, phone, garden or square view. Restaurant, reception, parking in front of hotel. Carlos from Mexico: Very nice hotel, everything was perfect, room, breakfast, etc. Staff very friendly, definitely I will come back once more. Katalin from Hungary: Cosy little hotel, I liked it very much. I hope I can get back sometimes to Telc and then I'll choose Hotel Celerin again. Paul Lankau from USA: Small, old world charm, quiet, excellent service and breakfast, and most of all excellent location. Room was spacious, light, inviting. 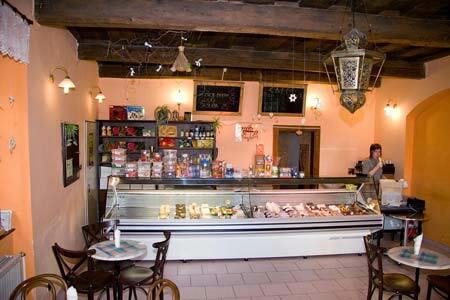 The location is superb, right in the corner of the beautiful plaza and its charming buildings. Ann from Hong Kong: We are very satisfied with the experience and service of the hotel. The staff are extremely friendly and helpful. Everything was well organized to meet our needs. We needed to leave early and they arranged for us to have an early breakfast alone in the breakfast room. They looked up information for us from the internet and booked a taxi for us. The room is very big and comfortable facing the beautiful square. We enjoyed our stay there very much. Linda from Australia: Lovely position, quaint room with view into square, breakfast excellent, staff extremely friendly, helpful & easy to communicate with. Mark from USA: The hotel was quite nice, clean, with nice breakfast. What happends if I submit the form? : As soon as you submit the form we will send you offer by email (availability, exact rate) and ask you for your address. In case you provide it you will receive confirmation.